Likewise, a private bicycle remains your responsibility even after you lock it to a bike rack. The advantage is that your origins and destinations are virtually unlimited and you know that you will always have access to it. Yet the advantage of the bike-share is that you are not bound to a single bicycle. You can take the bus, then pick up a bike, or ride the bike to the subway and come back a different route. However it is always possible that there are no bicycles at the station you desire to depart from or that there are no available docks in which to return your bike. This all goes to say that different lifestyles may be better tailored to one or the other, but clearly there is a large niche for the public bicycle. That’s all well and good, but why should I pay for it? As mentioned above, there are indeed user fees associated with the use of public bike-shares. However, these do not fully cover the cost of operations. The levels at which the rest are publicly or privately funded vary by city, although I think a case could be made for either. In New York City for example, there will be no public funding whatsoever, as was most likely dictated by the current economic and political condition of the area. The entire risk is being born by CitiBank, which has aptly named the network Citi Bike. As is evident in this case, additional revenue is made through advertising. Branding the entire system for example is done in New York as well London. Other advertisements are also common on the bikes themselves. Although many programs are proving themselves to be financially sustainable, I don’t think that public funding of such an institution is out of line either. Just as municipalities often fund subways, buses, and regional rail, I believe that the ample benefits that public bike-shares present to the local residents justifies some investment. Aren’t they really heavy and clunky? Yes. They are not the most graceful things on two wheels, but they get the job done. They are strong, rigid, and all of the cables and gears are protected inside the body. In my experience, I have only ever seen three gears on them, and none of them are particularly high. If you are looking for something to take on a nice, long, leisurely ride then these are probably not the bikes for you, but if you have a meeting a mile and a half away and you want to save some time then it could be a great mode of transport. But what about all the parking spaces they occupy? I find it particularly absurd to argue that a single parking space for a single private automobile serves the public better than the eight public bikes that can fill the same area. This is especially so in the areas that public bikes tend to thrive, where vehicle ownership is relatively low and active transportation is considerably high. They are also located in parks, plazas, and wide sidewalks where they will not impede pedestrian flow, but it all comes down to balancing the uses of a limited right-of-way. Don’t they shuttle these bikes around on trucks? One thing I must admit is that the environmental argument pushed by bike-share companies strikes me as a flimsy one. They often speak of the incredible carbon footprint they have negated by showing the users’ equivalent mileage traveled by fossil-fuel burning cars. I suspect that the overwhelming majority of trips made by public bike were at the expense of either walking or public transit, not the private automobile. And yes, the bikes are often carted between stations to compensated for uni-directional travel in the morning and evening peak periods. Of course the necessity of this varies by the demographics and layout of a given city. In areas where origins and destinations are more evenly distributed, the availability of bikes and docks will develop more organically. Won’t all these bikes just get stolen? I know that in the very early days of the BIXI system there were indeed many thefts due to a flaw in the docking mechanism that allowed the bikes to be leveraged free at a certain angle. This flaw was quickly remedied and I have not heard of any serious theft problems since. Unlike the days of Amsterdam’s White Bike program and Portland’s Yellow Bike program, which relied exclusively on the honor system, today’s bike-shares contain GPS within the bikes as well as credit card information in order to withdraw the bike. Perhaps I may be proven wrong, but to date, these systems seem to be quite secure. Won’t this just unleash a flood of novice urban bikers creating a safety hazard for all? This question touches on the very sensitive subject of who the urban right-of-way belongs to. In my view, the answer is that it belongs to all residents, young and old, rich and poor. Since the conclusion of the Second World War, urban transportation development has been dedicated almost exclusively to automobiles, particularly here in North America. In the past decade or so, many municipalities have undertaken valiant efforts to reclaim the right-of-way for all residents, not just those who are able and can afford to park and drive a car in the city. That said, given such auto-centric priorities it is little surprise that many people have not grown up learning how to safely ride a bike through the city. To answer the original question, I believe we must start somewhere, and that the best way to do this is by making cycling accessible to all residents by way of initiatives such as bike-shares and by making cycling safer for all users of the road by way of additional bike lanes and better signage. All forms of transportation carry some inherent risk, and it is most unfortunate that anyone should be injured or killed for trying to get from one point to another. For the time being though, I think if anyone is truly concerned about safety then his first priority should be to create alternatives to the most dangerous mode of transportation mankind has ever known: the automobile. Of course there are reckless and negligent cyclists, just as there are reckless and negligent drivers, and even pedestrians. I condemn all of them equally, but I think it is obvious that the reckless and negligent person sitting in two tons of glass and steel poses the most imminent threat to the others. So in conclusion, yes there are certainly dangers to cycling, especially from those who either ignore or are not aware of the rules of the road, but as we allow cycling to claim a greater role in the public consciousness I am convinced we will see safety improvements analogous to those we see throughout the evolution of the automobile. Well that about concludes my remarks on public bike-share systems. I hope that any skeptics reading may better understand the appeal and import of such programs and any supporters gained some points for persuading the aforementioned skeptics. In New York City for example, more than half of all trips are under 2 miles, a distance that is often inconvenient by subways and buses (especially cross town! ), yet quite far for walking. I look forward to seeing how New York’s Citi Bike program will play out and to another great season of cycling and urban exploration with BIXI! 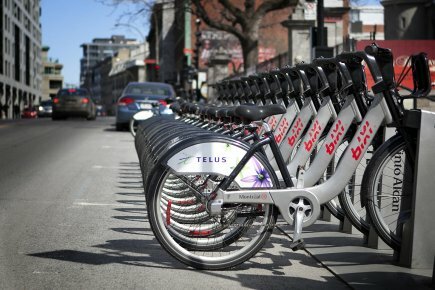 Any comments on the Bixi bailout? I addressed that indirectly with the remark about the legitimacy of publicly funding such programs. BIXI’s case was strange though because as I understand it, their operating budget was in the black, but they were losing money from setting up similar systems in other cities. Again, if I remember correctly, they were going to make money on those systems and pay back their loan from the city. My point in the article though was that even if the city was subsidizing their operations, it would still be a justifiable use of public money. Ah, okay. I didn’t realize that about BIXI. Well, it seems like New York has a pretty good system set up then, what with Citi Bank sponsoring the whole shebang. Thanks Andrew, much obliged! I don’t exactly know their operations but perhaps they are trucking them off-peak in preparation for the next peak period rush. I should also give credit where credit is due and thank you and Tim: I had to re-read that report we did for Transportation Engineering a couple years ago to refresh my memory on some of the details!